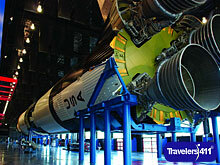 The U.S. Space & Rocket Center is a Smithsonian Affiliate and includes the Smithsonian's largest artifact, the Saturn V moon rocket that is a National Historic Landmark. The Apollo 16 capsule, an Apollo 12 moon rock and displays of Apollo-era space suits are also part of a collection that includes more than 1,500 artifacts from America's achievements in space exploration. The Center is the Official Visitor Center for NASA Marshall Space Flight Center and a showcase for national defense technologies developed at the U.S. Army's Redstone Arsenal. The Center's educational programs include Space Camp(r), Aviation Challenge(r), Space Camp(r) Robotics and U.S. Cyber Camp. Dr. Deborah Barnhart, CEO was on the March 3, 2018 "Travelers411" Radio Show in hour 3. Dr. Deborah Barnhart was also on the June 10, 2017 "Travelers411" Radio Show in hour 3.